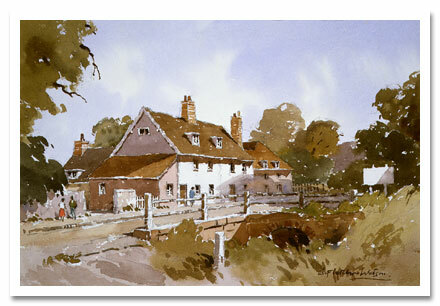 James Fletcher-Watson is regarded as one of the leading British watercolour landscape painters of his time. He was a member of The Royal Institute of Painters in Watercolour and the Royal Society of British Artists and exhibited at the Royal Academy, and received an award at the Paris Salon. He wrote many articles and several teaching books on watercolour painting, including The Magic of Watercolour and Watercolour Secrets. Three videos (now available on DVD) have also been made, in which he demonstrates how to paint out of doors as well as in the studio. This website is dedicated to James Fletcher-Watson and showcases his works.